When Bioware announced that story chapters would become repeatable in Knights of the Eternal Throne and come with an adjustable difficulty setting, I wasn't impressed, for reasons I don't want to fully rehash in this post. The bottom line was: I simply wasn't interested. However, since KotET's launch I've had many friends talk about Veteran mode chapters in gushing tones, about how fun and challenging and interesting they are, which got me intrigued at least. Since I was planning to do another run through the story anyway for my detailed write-up of all the chapters, I thought that I might as well take my Guardian through it on Veteran mode. After the first two chapters, the best way to sum up my impressions so far in a single word would be: confused. "Wrath and Ruin" barely even felt any different from story mode, causing me to pause early on to double-check that I hadn't accidentally started the chapter on easy difficulty after all. There was a random skytrooper that took off three quarters of my health with a single attack, which was a bit odd, but he still died just as easily. I finally started to notice a difference at the defense of the Tower of Prophecy, where I suffered a death, but I moved on easily after reviving. Similarly I managed to die on the walker section to the Shrine of Healing, but I actually managed to die there on story mode as well, so that was hardly a shocker either. Then I started chapter two, and the first mob I encountered, an elite vine cat, pounced on me, taking off two thirds of my health in one hit, and before I'd even fully grasped what was going on I was dead. Well, that was different! I proceeded to wipe another couple of times before I decided to level up my temporary companion's influence level into the twenties at least while I waited for cooldowns to come up again between attempts. Eventually I ended up having success by setting her to tank, as I couldn't control the spawning small adds fast enough for her not to instantly get mauled if she was healing. In the end she still died, but at that point the vine cat didn't have much health left and I could burn it down using my own cooldowns. Incidentally, its death caused my Guardian to hit level 70. Best ding ever. In this screenshot, you can see the string of vine cat deaths in the combat log before my final victory. By now I had been warned that the next fight would be even harder, though funnily enough that didn't turn out to be true (for me, anyway). I still wiped on it a couple of times, but that was more due to trying to be overly clever with mechanics than anything else. 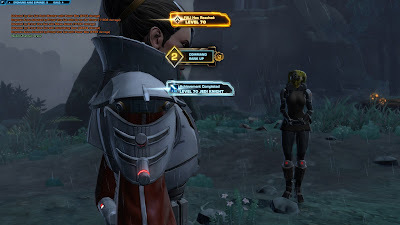 In the end I just made sure to set one of the assassin droids as my focus target and put my companion on passive at the start so that she wouldn't get any of the initial aggro (I had her back to healing for this otherwise). Then I hit saber reflect just before the long cast went off, set her back to actively healing me, and everything after that was pretty tank and spank. Up next: a tentacle monster tomb horror. This mere gold mob didn't actually have that much health, but hit like a truck and so did its tentacle add spawns. I eventually bested it by once again resorting to letting my companion tank and then following a very precise rotation throughout the fight: Send her in first, then use my leap to interrupt the horror's first, long cast. Do some damage, then interrupt the horror's first slam or whatever it's called with Awe, do some more dps, then kick. After that, take a step back as the tentacles should be about to spawn (or they were in my case at least) so you can kill the first one instantly. The second one will probably get a hit or two on your companion in, bringing her low. After killing it, taunt the boss so you can take some pressure off your tank - she will quickly taunt it back anyway. Now just nuke and you should be able to kill the thing before the second spawn of tentacles can do much. That's what worked for me anyway. But oh, that last boss. I had been told that it was going to be hard and expected as much, considering three golds were tougher than the usual fare even on story mode. The first couple of attempts I died within seconds of pulling, before the introductory voice-over had even had time to finish. It seemed impossible. But of course it's not: It's just extremely unforgiving and you need to learn all the abilities featured in the fight and when and how to counter them. That said, I never made it further than killing one of the mercenaries before dying myself. I spent an entire afternoon on trying to learn the fight, and at one point also invested in some gear upgrades and getting my companion's influence rank up into the forties. But it actually didn't seem to make that much of a difference - I couldn't out-live, out-heal or out-dps those abilities; if I mucked up the execution I was just dead no matter what. And with three mobs firing off different moves with a certain degree of randomness, I just couldn't keep up. Every time I'd die, I'd think: "D'oh, if only I hadn't missed that one interrupt / hadn't interrupted too early / hadn't lost aggro to my companion just then etc. I would have had it!" But I just couldn't reach the degree of perfect execution that seemed to be required. After spending several hundred thousand credits on repair bills, I gave in and simply asked my pet tank to help me. I'd still like to give it another go myself another time, but since the main purpose of that playthrough was to remind myself of all the chapter's details for my chapter by chapter discussion, I didn't want to be held up forever by being unable to beat that one fight. - I got the impression that you're better off doing these veteran chapters on characters below max level, as the tuning is different then, requiring somewhat less gear. Going in as a freshly dinged 70 is about the worst you could do. - Also, I strongly suspect that it's a lot easier on a ranged character, since all three opponents love to jump around, reducing your dps while you have to chase after them if you are melee. - The most important ability you have to worry about is the Leader's Hail of Bolts. It has a huge cone and at 70 it will take off nearly your entire health bar in one cast, so it needs interrupting asap, every time. He only ever casts it after having done a pull followed by a fire sweep, but sometimes he follows these moves up with something else, so if you accidentally waste your interrupt on the wrong thing, you're toast as well. You definitely want to have him as your focus target at all times so you have at least a clue when an interrupt is due. - The Leader's Ultimate Shot must never be allowed to go through, as it's an insta-kill, however it can simply be interrupted by hitting him. As a Guardian, you can also saber-reflect it, but you have to be careful not to lose aggro to your companion at a bad time, plus if your saber reflect works too well, it pushes him into his next phase too early and you're dead as well. Either way you want him to spend as much time as possible on simply casting this, because it's time during which he isn't doing anything else. - You have to kill the Mercs before killing the Leader. If he drops to 70%, he starts spreading fire everywhere, which spells doom if his adds are also still jumping around. - I found it helpful to have my companion on passive for the first couple of seconds, so she wouldn't instantly get aggro from everything. Once you put her back on active, make sure to sic her on one of the Mercs, so she doesn't go after the Leader and keeps interrupting his Ultimate Shot when you don't want her to. I think you also need to set her to passive for a bit during the Leader's fire phase, but I never really got that far. Maybe some of my readers will have some more helpful comments. Anyway, after these two chapters I'm not sure what to think of Veteran mode other than that the tuning is obviously all over the place. Challenge is good, but randomly switching between "barely any different from story mode" and "not sure if even technically possible with that class at that level" is less so. I'm motivated to continue to go through the rest of the chapters on Veteran just to see what they are like but... yeah. 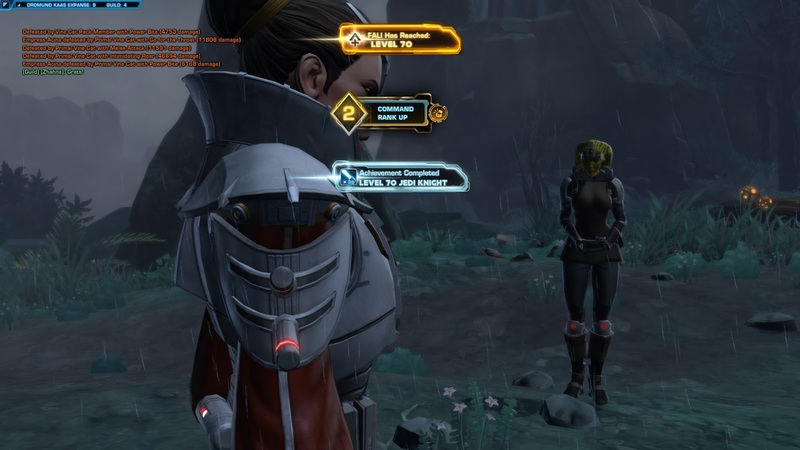 Bioware's idea of providing more challenging content for solo players seems rather haphazard right now. It's neat how we arrived at pretty much the same notes on encounter mechanics. But the good news is, there is nothing remotely as demanding in any subsequent chapter, so I would encourage you to continue. Cynically, I'm going to go with inadequate testing. Hah, I think I ended up reading that thread at some point while looking for tips. Didn't realise you were one of the people posting in it.